Definitely the chemistry set I received in elementary school. Loved it, although it was definitely not child safe. Some early train sets had a locomotive that had a smoke stack. You lit a cigarette, placed it in the stack lit end up, and it would puff the smoke as it ran. Yes, by all means, let's politicize this. Those darn liberals who don't have faith in Darwinism to weed out the stupid kids before they breed! 40-some years ago, my father's 11-year-old cousin rode his bicycle out into the street between two parked cars. Maybe he'd have survived being hit by a car if he had been wearing a helmet. But yeah, it was his own stupid fault, I guess. Years ago parents would install the tall orange flag on a kid's bicycle and teach the kid not to ride out onto the street without looking both ways. The flag helped drivers see the kid coming from between parked cars. Hah! My mom gave these to our neighbor as a birthday gift. Ha ha! I did that, too! Oops, broken thermometer! I was fascinated by the way it could be broken up into little balls but would instantly form a single ball when put together. I don't think I developed any long-term effects, though. When I was a young kid, I have BB guns and knives. Never used the irresponsibly. BB gun was never pointed at a living thing...ever. Just plinked cans. I had a lot of anger problems growing up and for some reason I kept getting pocket knives for birthday and Christmas gifts lol. They got hidden away from me. Not my toy, exactly -- they were at my grandmother's house, where they had belonged to my aunt, who was only 11 years older than me (I was born in 1969). 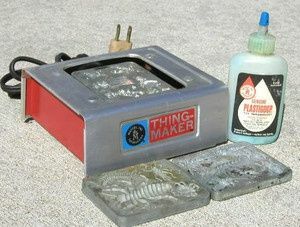 There was this stuff called Plastigoop, liquids in assorted colors and the consistency/opaqueness of Elmer's glue, similarly coming in bottles. 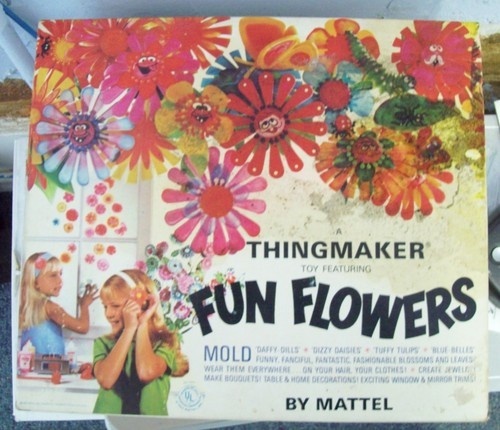 And you'd pour whatever color combination you want into these plastic molds of flowers, bugs, scary things, and so forth. And then... you cooked the liquid until it solidified, using these child-friend hotplates that got really hot! I have to echo the chemistry set mentioned on here in a few posts. I had a vintage set gifted to me a while back. All fun and games until I read that you could make cyanide with some of the ingredients. Yikes.